Each spring Horseshoe Crabs, a primitive creature that is really not a crab and is characterized by an odd, horse-hoof shaped “carapace” covering the front part of the body (the legs are underneath) come up on the beaches of the mid-Atlantic U.S. to lay their eggs and mate. This can coincide with the northward migration of Red Knots, a species of shorebird once common, but now increasingly rare, sad to say. Knots nest in the far north, even above the arctic circle, and spend winters as far south as southern South America. There are similar subspecies in Eurasia. At times the knots gather in substantial numbers, often along with other species, including Ruddy Turnstones. 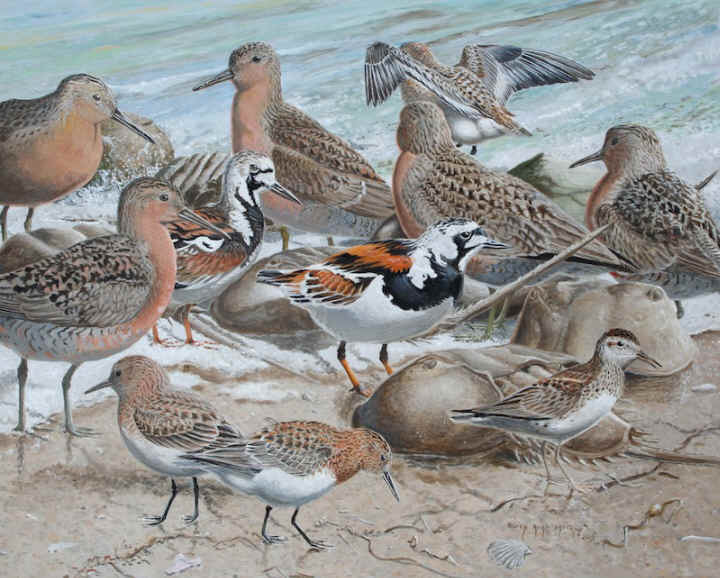 In this painting I’ve shown a group of Red Knots along with a pair of Ruddy Turnstones, in the middle, and two Sanderlings in breeding plumage, lower left, plus another Sanderling alighting behind a knot, at the top of the painting. And with these bigger birds is one lone Least Sandpiper, lower right, to show this is a western hemisphere scene. The other three species are Holarctic, but Least Sandpipers are normally restricted to the western hemisphere. Sadly, greedy humans have taken so many of the eggs of the horseshoe crabs to use for bait or fertilizer that the population of these fascinating creatures is in decline, and there was a subsequent collapse in the numbers of Red Knots, since the eggs are very important to them during this stage in their life cycle. 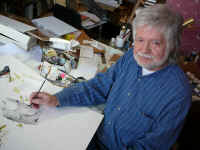 The painting is roughly life size, in acrylic, on compressed hardboard.